We know what American League fans have to be thankful for this year, but what about their cousins on the senior circuit? Will they celebrate the fact that NL clubs won the interleague series over the AL in 2018 for the first time since 2003? Do they gather 'round the table and remember their favorite at-bats by pitchers? Or maybe celebrate the most memorable double switches of the past year? Probably not. But what is certain is that the harvest of young prospect talent is bountiful for farm systems across the National League. Below is just a taste of what NL clubs and their fans have to be thankful for this Thanksgiving. Atlanta Braves: Major League-ready pitching -- It's well-known at this point but still remarkable nonetheless. Mike Soroka, Kyle Wright, Touki Toussaint, Luiz Gohara, Bryse Wilson, Kolby Allard are all top-100 prospects who pitched at some point for Atlanta in 2018 -- not just in the system, but for the Major League club! That depth is a big reason why many have been high on the Braves system for a few years, and it's not a huge coincidence that their arrival in The Show coincided with a division title. How will the Braves handle these arms going forward? It's possible they stand pat and keep the depth in-house, sending many if not most of that group back to Triple-A Gwinnett in 2019. Or they could use some as valuable trade chips in an effort to make improvements elsewhere, like at catcher or in the outfield. Either option is enviable. Miami Marlins: The Mesa brothers -- OK, so only one of the two Mesa brothers currently counts himself among Miami's top 30 prospects, and that's Victor Victor Mesa, ranked as the club's top prospect after signing for $5.25 million last month. His brother, Victor Mesa Jr., is on the outside looking in, but there's more to these signings than just the rankings. The Marlins are undeniably going through a rebuild, and that's only done right if the organization is investing in young talent. Adding the Mesa brothers is the clearest sign yet, perhaps even more so than last offseason's trades, that Miami is putting in the investment. While there's little immediate cause for optimism in the Majors, let there be some light in the long-term outlook. New York Mets: Justin Dunn -- Everyone bearing the blue and orange in Queens and beyond will spend time this Thursday singing the praises of Peter Alonso, hoping he can come up in April, if not on Opening Day. And rightfully so. What's a little more under-the-radar is the resurgence of Dunn, who at No. 89 overall is the organization's fourth top-100 prospect currently. The 2016 first-rounder had a down first full season at Class A Advanced St. Lucie, looking at times like he'd return to his roots as a reliever, but he bounced back nicely to show an above-average fastball and slider between St. Lucie and Double-A Binghamton in 2018. His 156 strikeouts ranked second in the system, while his 135 1/3 innings were a nice pickup from his 95 1/3 frames a season prior. After Alonso's arrival, Dunn's potential Major League debut could be the second most anticipated announcement in Flushing next season. Philadelphia Phillies: Luis Garcia -- The Phillies are expected to be big players on the free-agent market, in part because of a dearth of immediately available internal options on offense. Instead, look further down the ladder -- much further, in fact. Garcia, a switch-hitting shortstop who turned 18 last month, was one of the standout hitters in the Gulf Coast League this summer. He won the complex circuit's batting title with a .369 average while striking out in only 11.2 percent of his plate appearances. The Dominican Republic native also showed good speed and impressive skills at a tough defensive position just one year after signing for $2.5 million. He's ranked as Philly's No. 14 prospect but has begun to build the foundation to be the next big thing in the pipeline heading into a likely full-season assignment in 2019. Washington Nationals: Victor Robles is ready; Carter Kieboom isn't far behind -- Robles was featured in this spot last year, but after an elbow injury caused him to miss three months at Triple-A, he retained his prospect eligibility with NL Rookie of the Year runner-up Juan Soto passing him on the organizational depth chart. No worry. When Robles did return to the nation's capital, he looked every bit his toolsy self, hitting .288/.348/.525 with three homers and three steals in 21 games while providing solid defense from all three outfield spots. If the Nats can't keep Bryce Harper, Robles will work in with Soto, Adam Eaton and Michael Taylor to provide an impressive outfield in D.C. The Nats also have a bit of an opening at second base, following Daniel Murphy's trade to the Cubs in August. (Murphy was going to be a free agent.) So, don't be surprised if Kieboom -- MLB.com's No. 37 overall prospect -- takes over for Wilmer Difo at some point in 2019. The 21-year-old showed a solid bat in his second season, hitting .280 with 16 homers and an .801 OPS between Class A Advanced Potomac and Double-A Harrisburg. Though he's been a shortstop in the Minors, Kieboom isn't likely to unseat Trea Turner at that spot, and the Nats alluded to that by getting him time at second base in the Arizona Fall League. The biggest prospect in team history might be on the way out, but a promising duo is ready to fill some holes. Chicago Cubs: Nico Hoerner looks like the real deal -- There was a time when it seemed the Cubs and their fans should just go into "Wait until next year" mode with the organization's 2018 first-round pick. Hoerner played only 14 games before an elbow injury ended his season in mid-July. But the Cubs found him a spot in the Arizona Fall League, and the Stanford product took off, despite his limited pro experience. The right-handed-hitting shortstop produced a .337/.362/.506 line with a homer, four triples and four doubles in 21 games. His 45 total bases tied for third in the AFL, trailing only top-100 prospects Keston Hiura and Peter Alonso. Hoerner may eventually slide over to second base, but he's showing his bat could move him quickly toward Wrigleyville. With Miguel Amaya the Cubs' lone top-100 representative, they could use another talented position player in the pipeline, and Hoerner is ticking all the boxes of late. Cincinnati Reds: All aboard the Taylor Trammell train -- In 2018, Nick Senzel was meant to climb to Cincinnati, and Hunter Greene was meant to light up the lower levels. It didn't quite work that way as both dealt with injury/health concerns. Instead, it felt like the ascendant year of No. 2 prospect Trammell. The 21-year-old outfielder was a Florida State League end-of-season All-Star after hitting .277/.375/.406 with eight homers and 25 stolen bases in 110 games for Class A Advanced Daytona. He was the All-Star Futures Game MVP, homering and tripling on the big stage at Nationals Park. He handled himself well in the AFL, picking up a Fall Stars Game appearance. With the potential to be an above-average hitter with plus-plus speed, Trammell has climbed from No. 43 in MLB.com's preseason rankings to No. 17, and it's looking more and more like he could end up having the most fruitful career of Cincy's Big Three. 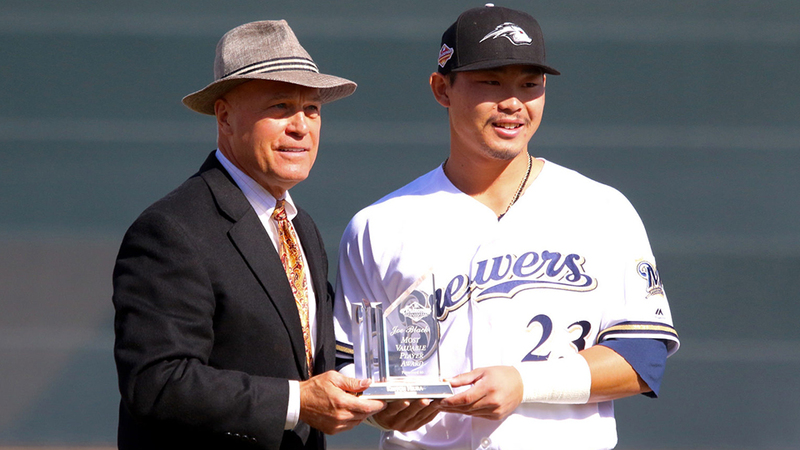 Milwaukee Brewers: Keston Hiura, MVP -- Arizona Fall League MVP, that is. But hey, it goes on the resume all the same. The Brewers' top prospect was expected to have the best non-Vlad Guerrero Jr. hit tool in this year's Fall League, and he didn't disappoint. Hiura hit .323/.371/.563 with five homers in 23 games this autumn and led the AFL in total bases (54) and RBIs (33). That uptick in power could be huge in the 22-year-old second baseman's development after he went deep 13 times during the regular season -- a solid number but not one indicative of a player who would let if fly regularly when he reached Arizona. Hiura should be at least an above-average hitter everywhere he goes, including the Double-A Southern League, where he finished with a 116 wRC+ over 307 plate appearances in 2018, but as he showed in the AFL, he has a chance to be even more than that. Pittsburgh Pirates: Cole Tucker on the upswing -- Here's where Tucker has been ranked among Pirates prospects at the end of each of his five seasons in the Minors: ninth (2014), 10th (2015), seventh (2016), seventh (2017). Now, he's up to fifth, leapfrogging fellow middle infielders Kevin Newman and Kevin Kramer, making it possible that Tucker will be the future of the shortstop position in Pittsburgh. (Yes, it's still likely that Oneil Cruz will move off the position at some point.) Tucker stands out for his plus speed as he showed by leading the Eastern League with 35 stolen bases this season. But he also showed plenty of bat in the Arizona Fall League, hitting .370/.442/.457 with an even 12/12 K/BB ratio over 95 plate appearances. That should be considered an outlier for a career .267 hitter, but it's a promising development nonetheless. The Bucs seem primed to give multiple shortstops a chance to snag the Major League job, and Tucker figures to be right in the middle of that competition as early as this spring. He was added to the 40-man roster on Tuesday after all. St. Louis Cardinals: Hot corner -- The Cardinals could be key players in the Josh Donaldson free agency race this offseason, but at the lower levels, they might have enjoyed their best production from the third-base spot. No. 7 prospect Elehuris Montero was the Midwest League MVP after winning the Class A circuit's batting title (.322) and leading it with a .910 OPS. The 20-year-old, right-handed slugger opened the season outside the organization's top-30 ranks but moved into the top 10 by showing good pop and a strong arm across the diamond. There were much bigger expectations placed on 2018 19th overall pick Nolan Gorman, and the former Arizona high schooler delivered in his first taste of pro ball. The left-handed slugger mashed 17 homers in only 63 games with Rookie-level Johnson City and Class A Peoria, finishing at .291/.380/.570 between those two stops. He very much looks like the Minors' next big full-season masher. Who will take over the hot corner in St. Louis in both the short and long term is still very much up in the air, but these two certainly did their part to keep their hats in the ring in 2018. Arizona Diamondbacks: Jazz Chisholm plays the hits -- Arizona boasts two top-100 prospects in Jon Duplantier and Taylor Widener, and Chisholm looks poised to join them. The 20-year-old shortstop broke out in the power department this season with 25 homers between Class A Kane County and Class A Advanced Visalia. (His previous season high was nine.) He carried that surge to the AFL, putting up a .442/.489/.767 line with seven extra-base hits and seven steals in an abbreviated 10-game stay. What's more, Chisholm is considered a solid shortstop with a good arm. Add that defensive value to the offensive gains he showed in 2018, and the D-backs could have a special player deserving more of the limelight come next season. Colorado Rockies: Tyler Nevin -- There are certainly bigger names in the Rockies system these days, but Nevin's might be on the tip of more tongues this week among Colorado fans. The No. 11 Rockies prospect is fresh off winning the Arizona Fall League batting title, hitting .426 over 17 games. (That's the best average by an AFL qualifier since Nate Roberts hit .446 in 2012.) What's more, Nevin showed incredible plate discipline, drawing 15 walks while striking out only five times in 71 plate appearances. Not the largest of samples, of course, but that level of performance against good competition certainly helps build the status of a 21-year-old corner infielder who looked like he had benefited from severe hitter's parks during the last two seasons at Class A Asheville and Class A Advanced Lancaster. Los Angeles Dodgers: Catching depth -- Yasmani Grandal is a free agent, but it might not be long before Los Angeles finds a suitable replacement -- not in free agency or on the trade block but internally. No. 2 prospect Keibert Ruiz and No. 5 Will Smith are both closing in on the Majors and could be ready for the Hollywood lights at some point in 2019. Both played at Double-A Tulsa this season, splitting duties behind the plate while Smith also got some time at third base. Smith might seem the closest of the two to the Majors, considering he's three years older and has some Triple-A time on his resume, but Ruiz beat him to the 40-man roster in light of the upcoming Rule 5 Draft. Both have good receiving skills and could be above-average hitters for the position. The Dodgers will pop up in trade rumors about catchers like Yan Gomes or J.T. Realmuto, but given what they have in the pipeline already, they might be better off looking for a stopgap to place next to Austin Barnes until one or both of Smith/Ruiz are ready. San Diego Padres: The whole dang thing -- There's the game's top shortstop prospect in Fernando Tatis Jr. There are two pure-hitting, Major League-ready prospects in Francisco Mejia and Luis Urias. There are arms -- lots and lots of arms -- seven of which feature among MLB.com's Top-100 overall prospects (MacKenzie Gore, Chris Paddack, Michel Baez, Adrian Morejon, Logan Allen, Luis Patino, Ryan Weathers) and two more (Anderson Espinoza, Cal Quantrill) who used to be on that list. There are toolsy outfielders like Buddy Reed. There are promising low-level infielders like Xavier Edwards and Esteury Ruiz. This is considered the game's top farm system for many reasons, headlined by its diversity and overall depth. The time for contention is coming quickly in San Diego, and the front office seems to be buying into that notion with the Padres coming up in trade rumors involving Jean Segura and Noah Syndergaard. The pieces are in place. It's just a matter of how patient they should be. San Francisco Giants: Joey Bart brings hope -- The Giants snagged Buster Posey with the fifth overall pick in 2008 and two years later, he was helping the big club capture a World Series title. San Francisco can only hope the same will be said of the second overall selection made 10 years later. The early returns are indeed quite promising. Bart, who like Florida State alum Posey came out of the ACC at Georgia Tech, had no problem adjusting to pro ball, hitting .298/.369/.613 in 45 games with Class A Short Season Salem-Keizer this summer. He also threw out 39 percent of attempted basestealers. He may have been a college star handling lesser competition, but the 21-year-old has shown his skills will transfer well enough that he's jumped over fellow NL West backstops Mejia and Ruiz for the top MLB.com ranking among catching prospects. Following his first Spring Training, Bart should be ready to take off in 2019, and the Giants could need him soon as they try to navigate away from baseball purgatory under new front-office leadership.